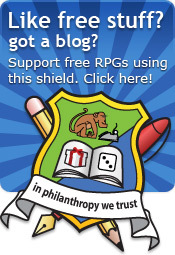 The Free RPG Blog: The 1KM1KT store - in the name of philanthropy! The 1KM1KT store - in the name of philanthropy! "What is this gallivanting arsehattery?" I hear you cry! "Has the shaven fool lost his faculties along with his follicles?" "Has he forgotten what philanthropy means, the bald face fool?" The premier* free RPG community now has a merchandising store where you can buy sweaters (jumpers in the UK), Baby Bodysuit (baby vests in the UK), T-Shirts (T-shirts in the UK) and just about any product you can emblazon a logo onto. You want a tote bag, you got it. You want a hoody? You got it. You want a giraffe with 1KM1KT tattooed onto its hind quarters? YOU GOT IT**. There are three designs: a simple 1KM1KT logo on the front; the 1KM1KT logo on the front and "PLAY not Pay" on the back; the In Philanthropy We Trust logo. They come in a variety of colours and shapes, sizes and products. There is stuff for the ladies or the small child you keep locked in the basement. Oh, that's just me? Why in the name of all things clean and good have you done this, Lang? I want to run more competitions. I want to run better competitions. I want to run competitions where the authors are bowled over. To do that, the Monkeys over at 1KM1KT need some funding. I could fund more but Mrs Lang would have to give up her sushi habit and Master Lang might have to jump school and head straight for the diamond mines. We're calling that Plan B. All profits go towards prizes for free-to-enter 1KM1KT competitions. You know the ones, unless you've not been paying attention. Well, there was 2012 24 Hour Little Spaces, 2011 24 Hour Movie Mashup Competition, 2010 Cyberpunk Revival Project and 2009 24 Hour Competition. The more we raise, the better the prizes! There are many hundreds of online stores with designs never sold. Not this one. Click these delightful images - if you dare - for bigger images of the same. 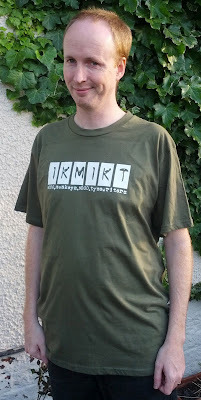 Here's a dashing gent sporting the 1KM1KT logo on the front. No photoshop here, he really is that shape. Here's the back of the same shirt. 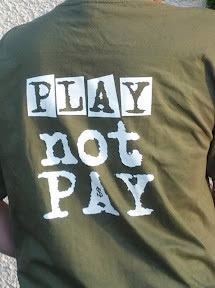 Play not Pay. It's a bold message but one we can all get behind. Here's a smooth faced cheeky chap - how young he looks in his In Philanthropy We Trust shield T-Shirt. Of course you do! If I had a hat on, I'd doff it to you. If the simplest shirts are out of budget then you can help by sharing this good news on your website, blog or scrawled across the front of your home in 10 foot text. Let those whose fireplaces are already stuffed to the mantelpiece with $100 bill fire-lighters buy the merch, for the rest there's solidarity. Tweet it, G+ it, Facebook it, for the retro-trendy-hipster-philanthropists MySpace it***. I have an idea for a design! Of course you do, you're a creative type - I can see that. Perhaps there's a free RPG design hanging about you would like pasted across your chest. Pop your idea in the comments or come over to the forum with your idea held high. I can't pay for your idea but good ones do get accepted! Catty_big on 1KM1KT came up with the inspired PLAY not Play slogan. Trust Lang with my money, NEVER! Quite right too, I'm an utter buffoon! Cafepress.com handle all the customer service side of the shirts, I ensure that the shop is up to date and that the designs I upload look OK. After that, any beef (or pork you might have is best solved by Cafe Press! * Well, my favourite. I can't really say premier because that would suggest that someone has done some sort of objective review of all the free RPG communities and awarded it some sort of standard. ** You don't got it really. Having said that, give CafePress 6 months and they'll be able to put your logo on a T-Rex. *** It's hip and ironic to be in a social network by yourself. I think we should go with Plan C.
I say, old bean, this is capital news! Of course, you cannot really say "premiere" at all, because that would refer to the first showing of, say, a theatrical play. (Whether the more thespian aspects of the sort of play we're talking about here really apply is, perhaps, a subject better left for another time.) In more ways than one, on the other hand, 1KM1KT is the "premier" role-playing philanthropy site, for which three cheers are in order! Gordon - Capitol plan! I'll action immediately. Spacemouse - What a buffoon I am! Thank you for the excellent spot. I sure both my other readers were discerning and polite enough not to mention it! ;-) I have fixed and so that I don't repeat this error, I have tattooed Premier across my ample forehead. Don't mention it, Dr Lang! 8D I'm sure one day they'll declare Grammar Nazism a crime against humanity and force me to denounce my former ways, but until then, I'll carry the flag shamelessly.